Paper or plastic is becoming a question of the past. Reusable bags have become a popular staple on any shopping trip, but finding the right reusable bag can often be a struggle. We want it to be small and compact to travel with yet also durable enough to carry all our purchases. Esse Reusable Bag has combined all those desires into one so that you can carry all that you need and be eco-friendly while shopping. Creators Dawn and Holly simultaneously came up with ideas to improve the reusable bags on the market. Holly wanted a bag that would fold small and live in her purse, and Dawn wanted a sturdier, more attractive grocery bag. Both needed more bags when shopping for their families. Together, they created a complete line of high quality bags to replace paper and plastic. The Esse CarryAll Tote holds all you need. The bag comes with 3 flat bottom grocery bags, 2 reusable produce bags and 1 Everyday Bag, which replaces up to 2 plastic bags with each use. The bags easily fold small and fit in the big pocket of the CarryAll Tote and even have extra pockets on the side to help organize coupons or shopping lists. Your next trip to the market just got a whole lot a little easier, and with the Esse CarryAll Tote in hand you can take on any shopping trip! Paper or plastic is becoming a question of the past. Reusable bags have become a popular staple on any shopping trip, but finding the right reusable bag can often be a struggle. We want it to be small and compact to travel with yet also durable enough to carry all our purchases. Esse Reusable Bag has combined all those desires into one so that you can carry all that you need and be eco-friendly while shopping. Creators Dawn and Holly simultaneously came up with ideas to improve the reusable bags on the market. 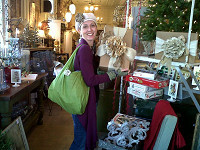 Holly wanted a bag that would fold small and live in her purse, and Dawn wanted a sturdier, more attractive grocery bag. Both needed more bags when shopping for their families. Together, they created a complete line of high quality bags to replace paper and plastic. The Esse CarryAll Tote holds all you need. 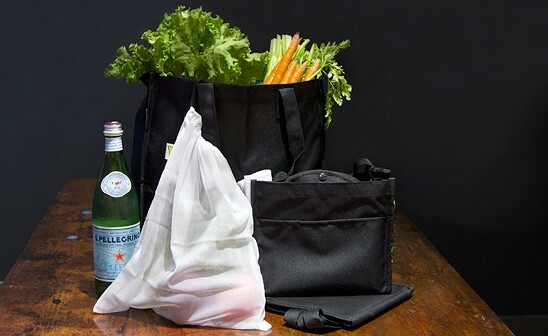 The bag comes with 3 flat bottom grocery bags, 2 reusable produce bags and 1 Everyday Bag, which replaces up to 2 plastic bags with each use. The bags easily fold small and fit in the big pocket of the CarryAll Tote and even have extra pockets on the side to help organize coupons or shopping lists.